“In my many years of study I have learned a language to express through painting. While painting, I tend to think of the process as a sense of “visual poetry”. My intention is never to depict a photographic rendering but a painterly representation of the essence of the subject . 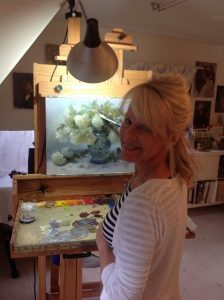 California fine artist Brenda Lee Gibson discovered her passion for art at an early age. Noticing her constant drawing, her intuitive grandmother provided her with a steady stream of supplies, paper and pencils. On Brenda’s twelfth birthday, her grandmother gave her a gift that would change her life: a paint-by-number oil painting kit. No longer confined to paper and pencils, Brenda was seduced by the creamy texture and luminosity of oil paint. After years of exploring many other forms of art and different mediums, Brenda eventually realized her true passions lie in figurative oil painting, and is inspired by masters of the past including William Bouguereau, Anders Zorn, Gustav Klimt, John Singer Sargent and Nicolai Fechin. Recognizing the dedication and focus needed to succeed as a figurative painter, Brenda dedicated years of intensive study at the acclaimed California Art Institute, learning the fundamentals of design, values, edges and light, and the art of the human form. While there, she studied with talented, accomplished artists such as Jeremy Lipking, Rick Morris, Aaron Westenberg, Ryan Wurmser and Michelle Dunaway, to name a few. Brenda’s skills continued to evolve under the private instruction of national award-winning artist Joseph Todorovitch, whom she greatly admires. Brenda continued her academic studies at the Los Angeles Academy of Figurative Arts where she worked with talents such as Russian-trained Vadim Zang, Ignot Ignotov, Stacy Kamin and Michael Seigal. In addition to numerous workshops, she has had the opportunity to study with Henry Yan, the extremely talented Chinese instructor of the San Francisco Academy of Art.